​Measure your doll's foot from heel to toe. Add 5mm to the length of the bare foot to determine the correct size of the shoe. 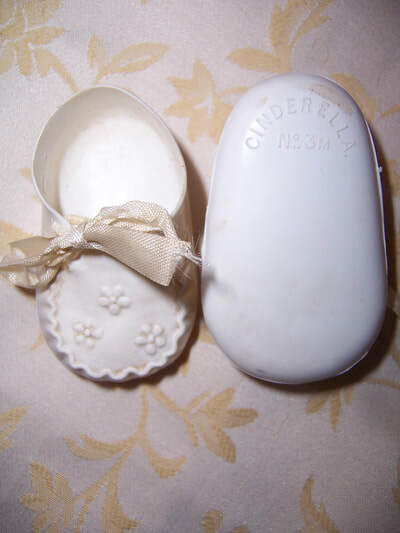 These vintage vinyl shoes have Cinderella No.3M on the soles of each shoes. They are circa 1950/1960 and are in good condition. ​They are a booty type shoe with original ribbon ties. They are modelled on my 22'' Pedigree doll but will fit other dolls. 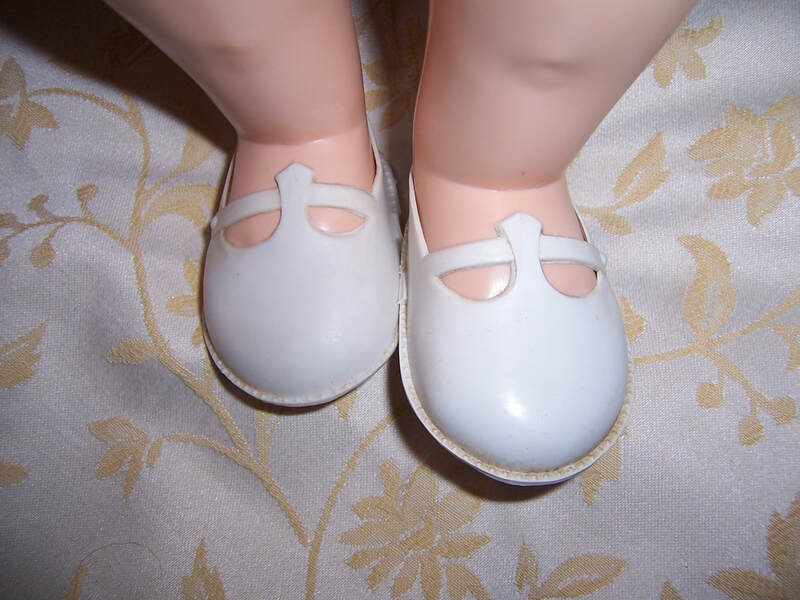 Please measure your dolls feet to make sure they shoes will fit. These shoes are rare Cinderella debutante shoes. They were made circa 1950/1960. They are white in colour, and are a slip on shoe with a t type bar at the front of the shoe. They are modelled on my 22'' Pedigree doll but could fit other dolls. Please measure your dolls feet to make sure they will fit. These shoes are so pretty with their ribbon ties at the front of the leg. The only colour available now is black. They fit our Giggles doll and look so good on her feet. We have also tried them on our 22" Saucy Walker doll, 20" Pedigree doll, and 22" Pedigree doll. They will fit lots of other type of dolls as well, but please measure the dolls foot to make sure it will fit. These cute little sandals are just adorable. They have a solid vinyl backing and have 3 straps on the front. The top strap forms the ankle strap which does up with a buckle. These would compliment a summer outfit. They are unused but are of old stock. They come in their original plastic bag which has ripped at the top. These shoes have been modelled on our 20' Pedigree doll and fit her perfectly. We have checked and they DO NOT FIT the Giggles Ideal doll. Her foot is too long for the sandals. 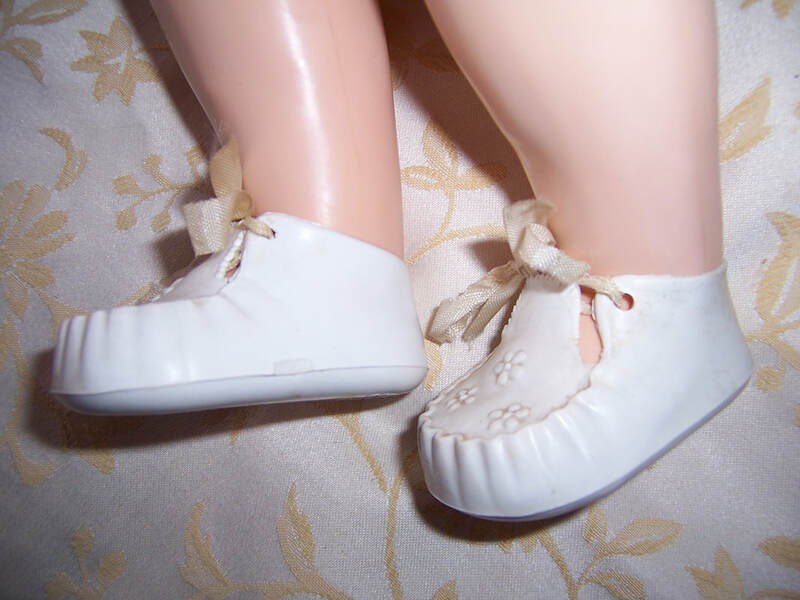 These shoes will fit other type of dolls but please measure their foot to make sure they will fit. 9.70cm long x 4cm wide at broadest point. These are the same type of shoes which Giggles is modelling but are much large in size. 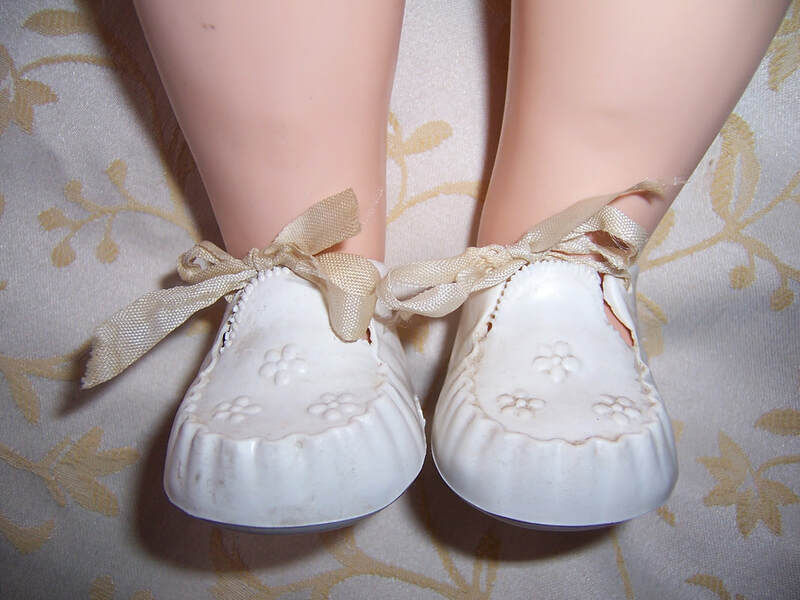 Our Brighton Belle, 28" Pedigree doll is the model for these shoes. 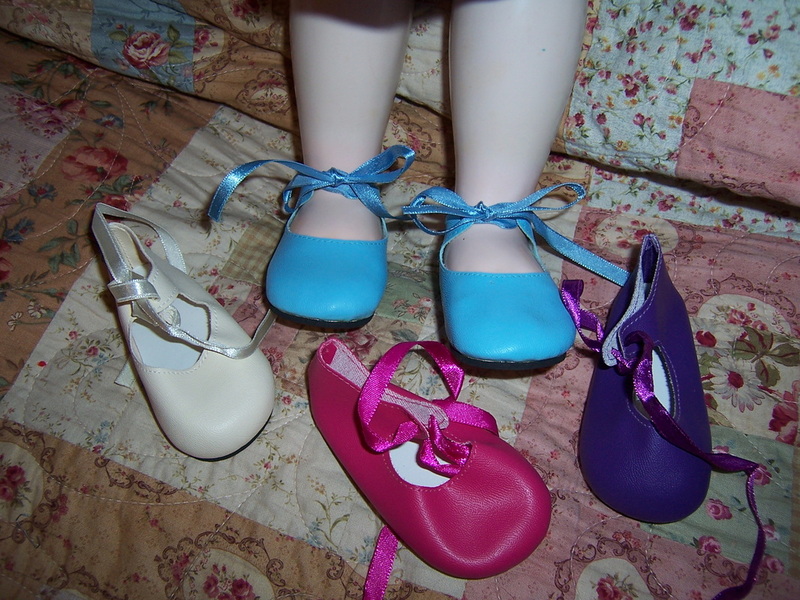 They tie up with a ribbon around the ankle which makes fitting on dolls much easier. They are lovely on her and would brighten up her outfits. The only colours available now are light blue. They will fit other type of dolls as well but you will need to measure the foot to make sure they will fit. Click button to go to more doll socks.